Maarten Vandenbemden (born 1994) was born in a house full of guitars. His father Roland is his first teacher for the guitar, while Maarten also studies the piano, organ, harmony and chamber music at the music academy of his hometown Tervuren. In 2011, Maarten is accepted in the class of Antigoni Goni at the Royal Conservatory of Brussels, combining the studies of Classical Guitar and Music Writing. After participating as a student in the Volterra Project of 2014, Maarten is inspired to carry on his musical journey from a broadened and refreshed perspective. A six-month Erasmus study in Napoli (Italy) further opens new horizons. In June 2017, he graduates from the Brussels conservatory with greatest distinction. Meanwhile, he has had the opportunity to follow a broad range of masterclasses with, amongst others, Sergio and Odair Assad, Sharon Isbin, Konrad Ragossnig, Yves Storms and Ian Watt. At the 2013 guitar festival of Kutná Hora (Czech Republic), Maarten was awarded the Special prize for best Interpretation by Štěpán Rak. A shared passion for chamber music led into the creation of duo Adentro with pianist Saskia Van Herzeele. Eagerly discovering the unsuspected possibilities of music for guitar and piano, they are fascinated by the world of music theatre and the encounters of music with other art forms. In 2018, Adentro was finalist of the Supernova competition (BE) and winner of the chamber music competition at the Twents Guitar Festival (NL). Moreover, Maarten frequently performs together with Noémie Schellens (soprano) and Kobe Baeyens (baritone). Besides playing, he also loves writing his own arrangements of music he finds compelling and attractive, his arrangement of three Spanish folk song settings by Federico Garcia Lorca being published this year by auurk ed. 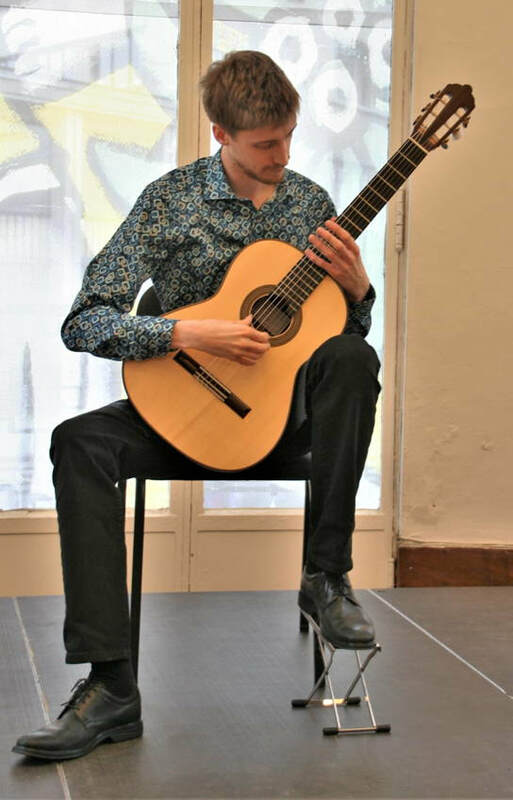 As a soloist, Maarten has performed with several orchestras and in 2017, he was winner of the Ghent International Guitar Competition and finalist of the first Honda Competition for Classical Music, leading to a performance at the Bozar centre of Fine Arts (Brussels). Since 2016, each July, he is enthusiastically involved as an assistant in the Volterra Project, one of the most unique and innovative Summer Courses in the classical guitar world.